Tasseling, an extension of the ever-popular balayage colouring technique is set to be the new colour trend for Summer 2017. This freehand weaving technique not only creates cascades of colour, but also can be applied in half the time of traditional foiling. Aleks Abadia, Esstudio Galleria's Director of Hair says, 'We live in a time poor world, so innovating and testing new colour techniques that save time but still deliver great results is critical. In 2016 it was all about veiling, for 2017 it will be tasseling." 3. Rather than sectioning the hair and then weaving, weave the tail comb from the part-line. 4. Create a zigzag section no thicker than a few cm thick then gather the hair and weave. 5. Using a mixture of freehand and foiling apply the colour. 6. Make sure you feather the colour towards to roots to create a soft effect rather than a hard line. 7. Run the comb down the length of the foil to disperse the colour through to the ends. Tasseling is available now at Esstudio Galleria: Parramatta & Chippendale – www.esstudio.com.au - prices start from $180. 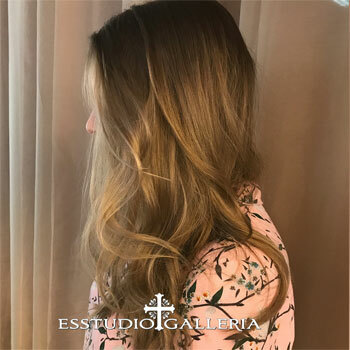 Established in 2011, by hairstylist Aleks Abadia and beauty therapist Jacqui (Jax) Arnold, Esstudio Galleria has quickly become an institution for all things beauty. Located in Sydney's inner city artistic hub of Chippendale and also their new space in Barrack Lane Parramatta, the duo specialise in the entertainment industry and offer first class service without the attitude.